The ME-AGS-N and ME-AGS-S Auto Generator Start controllers can automatically start your generator based on battery voltage or inside temperature. 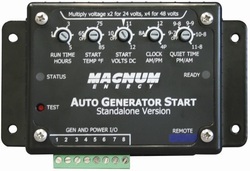 Available as a fully networked system (ME-AGS-N) or a standalone system (ME-AGS-S) that do not include a Magnum inverter. Starts most diesel or gas generators. Adjustable settings include: run time, start volts DC, start temp, quiet time, and 24 hour clock. The ME-AGS-N is the 'network' version that allows operation via a Magnum Energy Inverter and ME-RC50 or ME-ARC remote panel. When using the ME-RC Remote, the ME-AGS-N has basic adjustments starting on battery voltage or temperature. When using the ME-ARC remote, the ME-AGS-N has advanced start and stop settings based on: Time of day, battery State of Charge, battery voltage, high temperature, or inverter load amps. Also includes the ability to manually turn the generator ON and off, generator exercise, warm-up and cool-down. The ME-AGS-S is the stand alone version that is similar to the ME-AGS-N, but works for installations that do not include a Magnum Energy inverter and the remote control. Or call for our discounted price! Idaho residents please choose shipping with Idaho Sales tax added on the Authorize.Net payment form (check out) or your order will not be processed.